Think fast, but not too fast! The Hustler will call out a word. Everyone else has to slam a letter down on the table that's in that word. You don't have a letter in the word? Grab any letter as quickly as you can. If you're last to play, you might get a penalty. Grab a wrong letter, though, and you suffer a bigger penalty! Show off your vocabulary, laugh at your friends. All this fun for only $5. 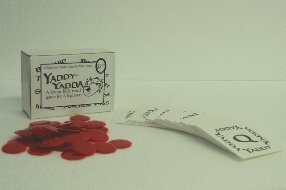 Yaddy-Yadda is a word game in a class all it's own. A game takes about 20 minutes and comes with everything you need to play. Visit the Black & White Games homepage for more great word games using the Yaddy-Yadda deck!! "Mike Petty's philosophy on game design is simple. He makes games that are inexpensive, easy to learn, and fun for everyone. I especially agree with the third point, games are first and foremost about the fellowship between players. Yaddy-Yaddy.... delivers on all three counts. It is as engaging as any party game on the market, can be learned by all in literally 30 seconds, and at only $5.00, I doubt you'll find a more cost-efficient game. What's more, if you check back on the website, Mike and co. are always coming up with new and creative games to be played with the same deck of cards. Skeeter is a fun time filler for fans of mini-Scrabble, and Yaddy-Yadda Haiku lets players really utilize thier right brain. If your group is always looking for a quick, fun game to fill some time, this certainly fits the bill."